Anglus Thompson, William L. Thomas and Rico Mitchell. Police say the tips from watchful residents helped them arrest three individuals on various drug charges in Culpeper, Va. this week. Officers began forming a lookout outside a home on Monticello Avenue in the Dog Hill neighborhood. Just before 10 p.m. they saw a 2005 Mercedes Benz at a home under surveillance. Three men were inside of the car, and it had previously been described as car used in possible drug sales at the same home. When police searched the car, the found crack cocaine, scales and packing typically used to sell narcotics. 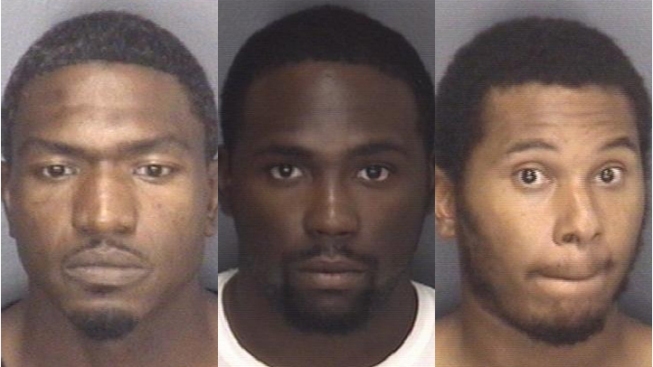 They charged 22-year-old Rico Mitchell of Haymarket, Va. and 20-year-old William L. Thomas, Jr. of Culpeper, Va. with possession with felony intent to distribute cocaine. Thursday night, police conducted a drug search warrant at a home on Fourth Street. There, they found a large amount of suspected PCP. Thirty-eight-year-old Anglus L. Thompson of Culpeper was arrested on felony charges of possession with intent to distribute PCP.